For me, one of the most fascinating aspects of the whole Paul Is Dead rumor is that the search for clues often extended outside the songs themselves. In the beginning, people were simply listening for clues in the song lyrics, then pouring over the art on the album covers. From there, they started playing their records backwards. When that was done, they began looking at anything associated with the albums, including inserts like posters and booklets. That’s what led to people finding clues in the poster included in initial pressings of The Beatles’ 1968 release, The White Album. In 1968, when it came time to develop the artwork for the Beatles’ latest album, the task fell to artist Richard Hamilton. It is said that Hamilton wanted to create an album cover that was the complete opposite of the elaborate production featured on the Beatles’ last release, Sgt. Pepper’s Lonely Hearts Club Band. Hamilton also wanted to contrast the lengthy title of Sgt. Pepper’s. 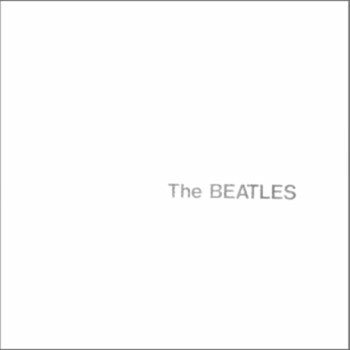 The result was a plain, all-white album without any title that became known as The White Album simply because, well, it was white. As the story goes, shortly after the decision on the album cover was made, Hamilton and some of the Beatles started to feel a little bad about giving fans an album with no artwork to look at. So they decided to include 4 color photos, one for each Beatle, as inserts for the album. 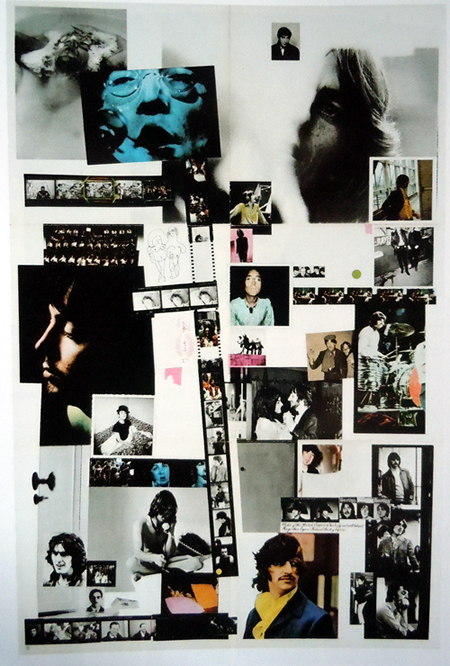 A decision was also made to create a photo collage poster, with lyrics on the reverse side, to accompany the album. There are 3 alleged clues lurking in the poster. The largest, and therefore often referred to as the “most obvious”, resides in the upper left corner of the poster. 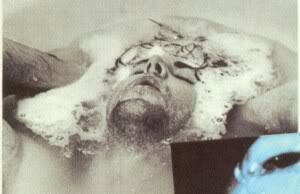 The image is of Paul McCartney in the bath tub. Specifically, it’s a closeup of Paul’s head and portions of his arms. Looking at the image above, you can see why people immediately claimed this was a clue. I mean, it clearly shows that Paul McCartney had been decapitated in a car crash, right? On top of that, Paul’s eyes are closed, further confirmation that Paul was, in fact, dead. The next clue is towards the bottom left corner of the poster. Somewhat hidden amongst larger pictures is a small one said to depict Paul McCartney wearing a disguise he’d don to avoid being mobbed by fans when he went out in public. Cluesters, however, will tell you that the photo is actually of William (“Bill”) Campbell, the gentleman who won a Paul McCartney look-alike contest and was chosen by the other 3 Beatles to take Paul’s place. 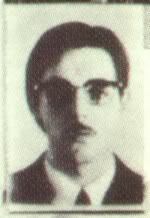 To them, the photo shows Bill before his transformation into Faul; “Fake Paul.” (NOTE: Some believe the man’s name is actually Billy Shears, not William Campbell. You know, the same Billy Shears the Beatles “introduced” to us on Sgt. Pepper’s Lonely Hearts Club Band. But that’s another story for another day). The last, and spookiest, clue is near the bottom right of the poster. It shows Paul McCartney in profile, clapping and dancing. Nothing strange or out of place here. Or is there? If you look right behind Paul, there appears to be a pair of skeletal hands reaching out for him. Those hands are said to represent all sorts of things, none of which are good. But basically, they are said to mean that Paul had been somehow marked for death and that, after his demise, the surviving Beatles added this photo to the poster to alert their fans to the fact that Paul was indeed dead. I’ll be honest: Of the three “clues” said to be hidden in the White Album poster, this is the one that’s the creepiest to me. Not sure what caused the image to appear (operator error, mistake during processing, soul-munching ghouls), but they certainly do look like a pair of hands. So there you have it, friends. What sayeth you? Are there really clues to Paul McCartney’s untimely demise lurking within the White Album poster? Know of any clues that I missed? Let me know! For more (non-PID) information on the Beatles’ White Album, check out this great, in-depth article on The Beatles Rarity. More Paul Is Dead “evidence” can be found in the Paul McCartney Death Clues wing of The Strange & Spooky Museum. The last of the 3 “clues, is a picture of Paul trying to open, or to keep open the doors as he walks into the funeral for Brian Epstein. There are photos of the other 3 walking through the same door to the funeral home or synagogue. The “ghostly hands” were simply a result of folding the picture over by someone, perhaps Paul. You can do this yourself simply by folding a picture over until the image cracks and distorts. The photo of supposedly William Campbell I have never been able to explain. It could be the Paul lookalike (does anyone have any info about a “Paul McCartney Look-alike Contest)? That particular picture on the lower left still scares me!